Prepared using extra lean ground turkey breast and Panko bread crumbs. In large bowl, combine turkey, onion, sauce, bread crumbs, salt and pepper; mix thoroughly and shape into 6 patties. 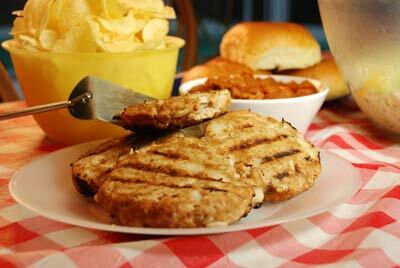 Place patties on grill and cook 4 to 6 minutes on each side or until completely done and no longer pink in the center.